On River Street spanning the Squam River as it flows from the Little Squam Lake in Ashland. The bridge is 61'0" long with a clear span of 25'9". It has an overall width of 23'6" with a roadway width of 14'0" and a maximum vertical clearance of 14'1". There is a sidewalk on the Little Squam side of the bridge. The bridge is posted for ten tons. This covered bridge replaces a steel and concrete bridge that was condemned by the state on River Street in Ashland. After the condemnation, the state proposed a two-lane steel bridge for this site. The citizens of Ashland, however, decided they would prefer a one lane covered bridge. At the 1988 town meeting, the town voted to place $35,000 in a fund earmarked for building a new covered bridge. The balance of funds needed for this project were raised by the Squam River Covered Bridge Committee of the Ashland Historical Society. Additional funds were raised through special events such as bake sales and dinners, but the bulk of the money came from direct contributions from over 500 donors. The bridge was constructed by Milton Graton and Sons. It was officially dedicated on July 1, 1990. 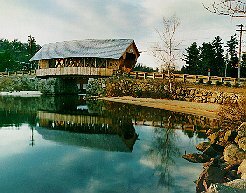 The Squam River covered bridge was constructed in a manner which replicates the traditional style of covered bridges. It has not reached the 50 year age criteria to be listed on the National Register of Historic Places.